Upcoming Samurai Action RPG game; Nioh has a playable demo out this week. 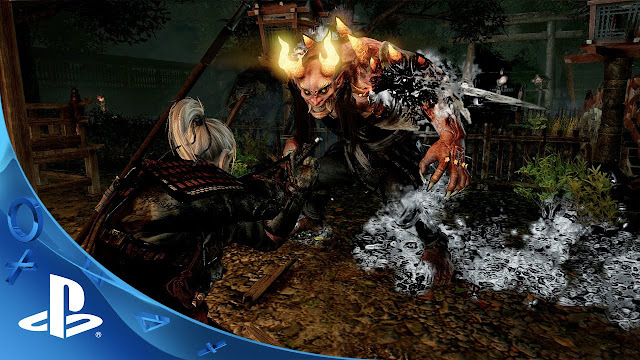 Published by Tecmo Koei, and developed by Team Ninja, Nioh will be a PS4 exclusive. Tha Alpha Demo is out on the EU PlayStation store and should be out on the US PSN store later today. No updates on the Asia Store however. Edit: Asia PSN store has it up! The demo will run from April 26 to May 5. "The demo includes two areas (a ruined fishing village called Usuki and an ancient region called Dazaifu overrun by demonic beings) and three weapon types (A katana, spear, and an axe)." An exclusive DLC, named The Mark of the Conqueror, will be rewarded to players who complete one stage of the demo. It's mentioned that there are no plans for this exclusive DLC to be made available to players who didn't try the demo. There seems to be an emerging trend of rewarding players for trying out betas/demos. I think that's a cool incentive to get people on board and hopefully convince them to get the game when it releases. A nice bonus as well for those who have been following the game from the start. I have been wanting a Remastered collection of the Ninja Gaiden games for the PS4 but I'm content with this. Just hoping that this will be a bit more playable compared to Ninja Gaiden's notorious difficulty. The difficulty level was what turned me away from the series initially, so hoping that Nioh would be more enjoyable.